1. (*) means that service is available at extr a cost. 2. Service Level Agreements (SLAs) are less than 2 Hours response time for Emergency issues and 1 Business day for non-critical issues. 3. All costs are labor only. All hardware and software cost are borne by the customer. For all your existing hardware and software, the plan will include support for an unlimited number of incidents per month. There is a limit of 1hr per incident – if an incident will take longer than this to troubleshoot and remedy then our consultants will advise you of the cost before undertaking the additional work. 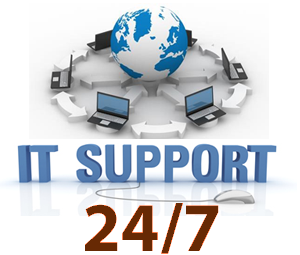 An online support ticket facility is available to allow users to report and track issues until the support incident is rectified and ticket closed. We can remotely access all your desktop computers, laptops and servers to troubleshoot a majority of the support incidents without having to visit your site. We use the latest software to allow us to make an encrypted connection. With servers, we can troubleshoot the incident whilst you continue to work and with your desktop computers and laptops, you can watch us as we sort out the problem. Where a backup has been scheduled on your server, we will connect remotely on a weekly basis to confirm that the backup is taking place. All the Microsoft Windows updates on your server are automatically installed by us at a time convenient to yourselves. Therefore, the server won’t be down whilst we apply those updates. With our PAYG service, we charge a call out fee. With our support plans, no call out fee is charged and we’ll spend up to an hour onsite for free to fix the issue. A Service Level Agreement is drafted and agreed by both parties. This includes details of what hardware and software is covered by the service contract, the level of cover and guaranteed response times for different priority issues. If the response times aren’t met during any month then you’ll receive a 10% refund on your monthly subscription. Minor server / domain tasks are included in the support plan. Examples of these are adding users and setting up additional email accounts. If a server virus solution has been installed then we’ll periodically check the virus program server console to verify that no viruses have been detected on the network. If they have, then we can schedule for the infected computers to be cleaned. Any minor version updates that have been released for existing software which has been installed on the computers within your network will be applied on request. As an example, an installed program that is currently on version 10.1 could be updated to 10.2, 10.3 etc. (but not to version 11 which would be a major version update). All clients who sign up to one of our support contracts will be eligible for a 10% discount on any extra work that is not included in the contract. This discount cannot be applied to hardware or software costs. Where a backup has been scheduled on your server, we will connect remotely on a daily basis to confirm that the backup is taking place. We’ll produce a step-by-step plan which provides a structured approach should the unforeseen happen with your IT infrastructure - whether that’s due to theft, flood, users or hardware failure. This will help the business get back up and running as quickly as possible. 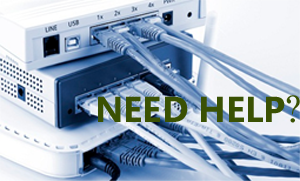 Do you have good experience of dealing with your broadband / cable internet providers? Most users dread ringing up their help desks to troubleshoot issues! We’ll liaise with them on your behalf to get your service up and running as quickly as possible. For an increasing number of businesses, their domain name is extremely important as it maps to their website and their email addresses. We’ll manage your domain names – whether this is setting up subdomains, configuring new email addresses or registering new domain names on your behalf. When you’ve purchased new software then we’ll install it on the computers (clients and servers) that you ask us to. This also includes any major version updates of existing software that you have. We know that during the course of a month, they’ll be IT issues that fall outside the scope of the support plan. You might also have some general queries that you would like answers to. With that in mind, we include some additional on-site time for these types of IT issues. If you’d prefer to use the time up for remote support then that’s no problem either! The silver plan includes 30 minutes and the gold plan 60 minutes. Our support plans are designed to cover your existing hardware infrastructure. What happens if a piece of your hardware has developed a fault and you’ve replaced it? We’ll include in the support plan the time taken to setup and configure this new replacement hardware. One of our strengths is the knowledge that we have of the IT industry and new technology that’s emerging. We’re happy to include the time necessary to research and advise on any impending IT projects you might be planning. We’ll produce an asset register of all the IT equipment that falls under the scope of the support plan. It will include a detailed specification of all the hardware / software and can be used for insurance purposes. We’ll update it on each anniversary of your support plan. Do the Board or Owners of your company need advice on their IT strategy over the coming months or years? We’re happy to provide advice at board meetings or on a one-to-one basis as to what the company’s IT needs are likely to be and what budget should be allocated for upcoming projects. When hard drive space becomes critically low on your server, your whole network will rapidly stop functioning as you’d hoped. The server will become slow and unresponsive making it impossible to run network applications. Users may also not be able to save their work. We’ll monitor the hard drive free space on the server to make sure we’re aware of this issue and put measures in place to prevent it happening. How often do you test your backup? Most companies only restore the backups they’ve done in emergency situations. By this time, it’s too late if the backups haven’t been successful and there are errors in them. Every 6 months, we’ll bring in a test server to your company and complete a test restore. We’ll check a selection of files, mailboxes and any database applications that you use to ensure that you can be back up and running without any data loss should the need arise. The GFI Max RemoteManagent suite is an award winning set of programs that allow remote monitoring by Harborne Computers of your server, workstations and network to ensure it’s healthy without your intervention. This pro-active approach allows us to monitor your IT infrastructure and resolve many issues before you even know about them!